You know what I just realized? I’m a little tiny wee bit obsessed with making vegan chocolates at home. 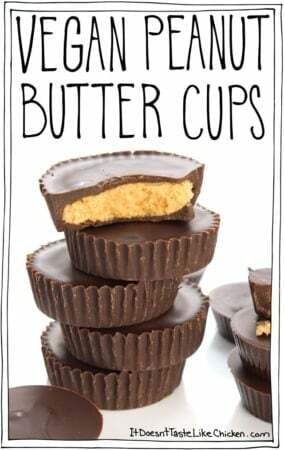 So far I have shared with you my Vegan Peanut Butter Cups, Easy Vegan Coconut Mounds, Vegan Chocolate Creme Eggs, and Easy Fruit & Nut Vegan Chocolates. Yeah, I know, so many chocolates! Obsessed. 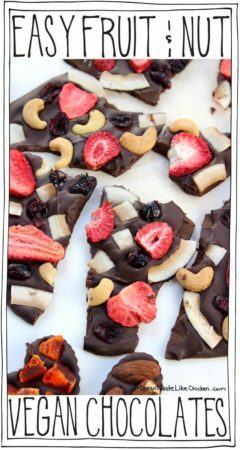 The thing is, as much as it’s easy to buy veggie dogs at the grocery store, the chocolate makers haven’t really seemed to catch up with the times yet, as there aren’t many vegan chocolates on the market. No worries, problem solved: make your own! Yeah boi! 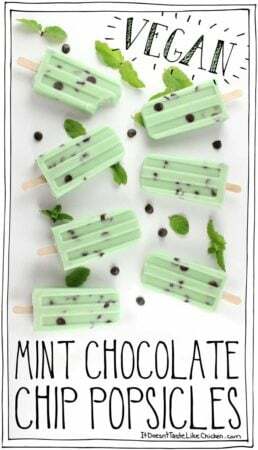 I love the mint chocolate combo, it’s one of my all-time favourites. I regularly sip on mint chocolate tea, with (probably) way too much sugar and soy cream stirred in. (Shhhhh don’t judge me), it’s so yummy. 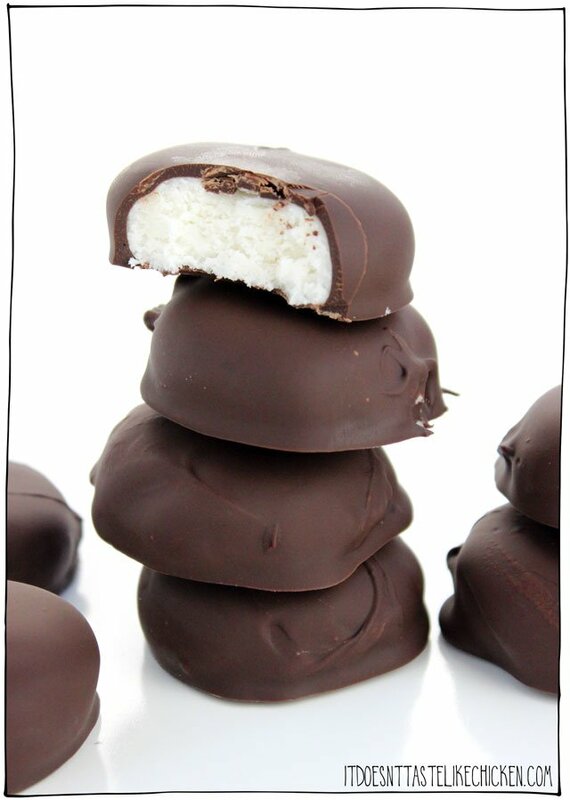 So these Vegan Peppermint Patties are way, way up there on the super delicious scale. 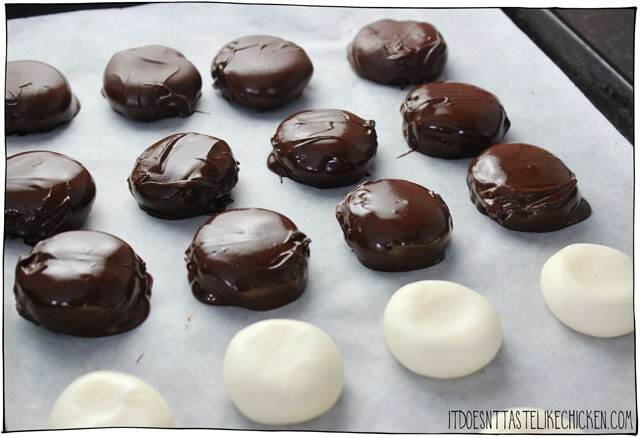 Only 5 easy ingredients to make vegan peppermint patties (no really, that’s it). They make a great gift (if you are ok with giving them away). They also store for a long time in the fridge or freezer making them a great little sweet treat to have on hand. To make Vegan Peppermint Patties: use a hand mixer or stand mixer with a large bowl to beat the powdered sugar, vegan butter, agave, and peppermint extract together, making sure the butter gets completely mixed it. It may look very crumbly. Use your hands to gather up the mixture and form a ball. Knead it together a few times making sure everything is nicely incorporated, and the dough holds together nicely. Take 1 tablespoon of the dough and shape into a patty. 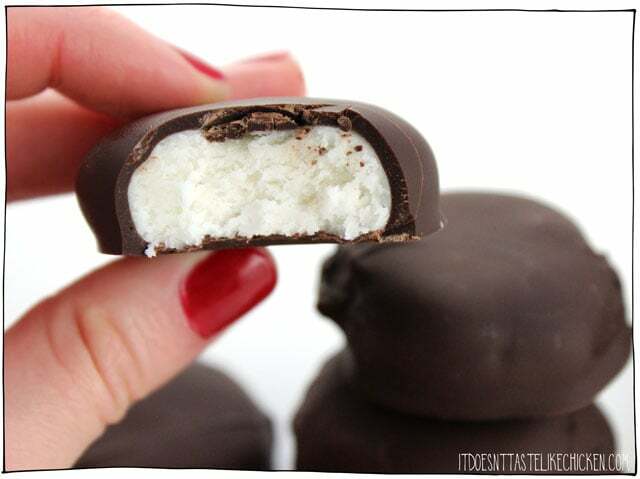 I like my vegan peppermint patties nice and thick, but if you are more of a thin mint type of person, feel free to make them thinner. 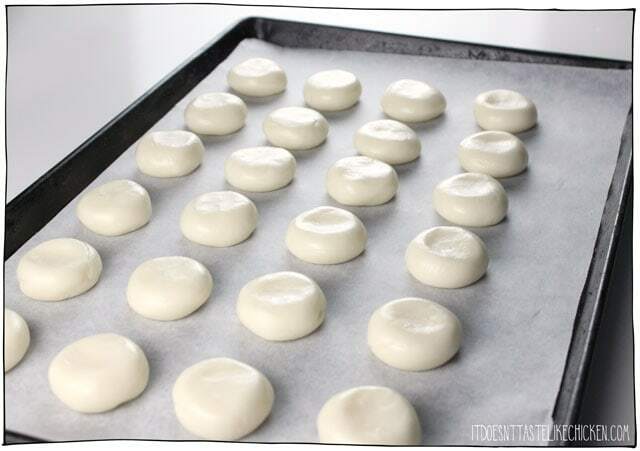 Lay the patties in a single layer on the parchment lined baking sheet. Repeat until you use up all the dough. Pop in the freezer for 15 minutes or longer to set. 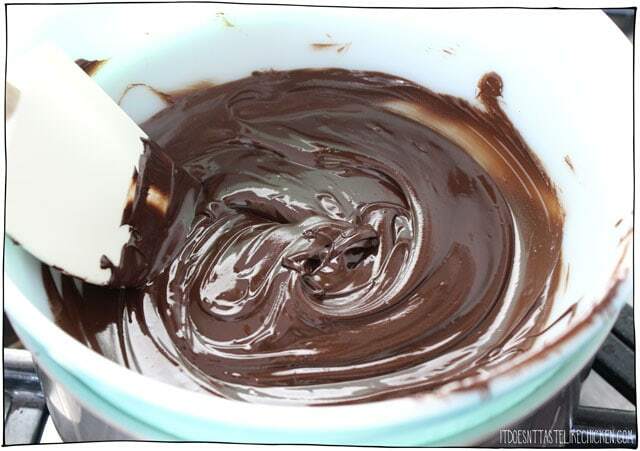 Take one patty at a time and dip it into the chocolate, turning to evenly coat. Shake off excess chocolate then return the patty to the parchment lined baking sheet. I found using two forks, one in each hand, was the easiest method for dipping. If the patties start to soften before you finish coating them all with chocolate, return to the freezer to chill as needed. Once finished and all of the patties are chocolate coated, pop the tray back in the freezer set for about 10 minutes until the chocolate is completely set. Enjoy! 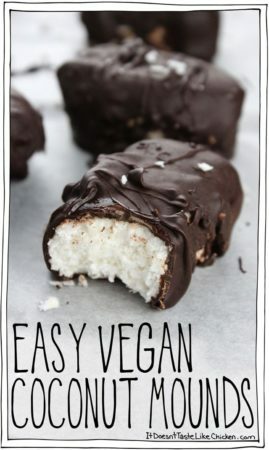 Only 5 ingredients to make this amazing dairy-free chocolate treat. The perfect combo of sweet mint and chocolate. Great for a gift. 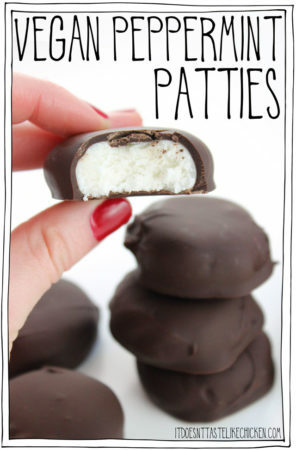 Lightly adapted from Butter with a Side of Bread's Homemade Peppermint Patties. 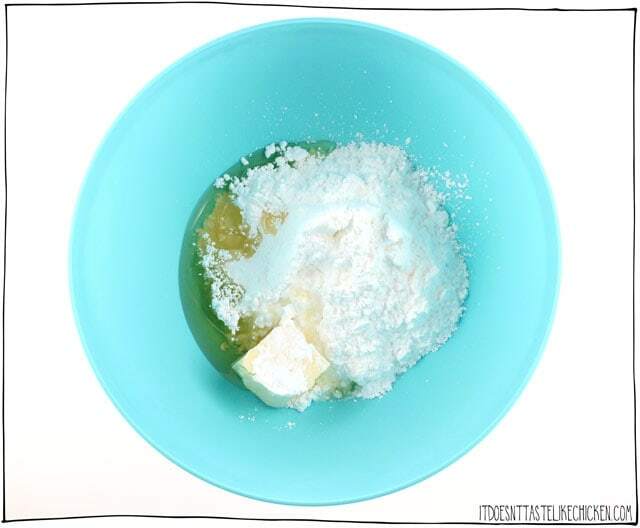 Use a hand mixer or stand mixer with a large bowl to beat the powdered sugar, vegan butter, agave, and peppermint extract together, making sure the butter gets completely mixed it. It may look very crumbly. 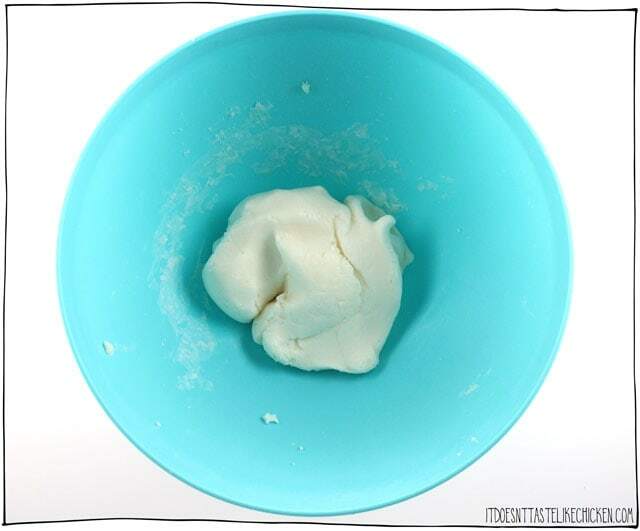 Use your hands to gather up the mixture and form a ball. Knead it together a few times making sure everything is nicely incorporated, and the dough holds together nicely. Take 1 tablespoon of the dough and shape into a patty. I like my vegan peppermint patties nice and thick, but if you are more of a thin mint type of person, feel free to make them thinner. Lay the patties in a single layer on the parchment lined baking sheet. Repeat until you use up all the dough. Pop in the freezer for 15 minutes or longer to set. 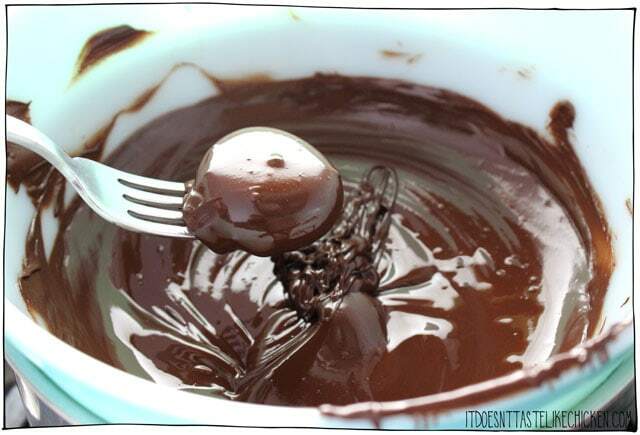 Melt the chocolate chips in a double boiler. Take one patty at a time and dip it into the chocolate, turning to evenly coat. Shake off excess chocolate then return the patty to the parchment lined baking sheet. I found using two forks, one in each hand, was the easiest method for dipping. If the patties start to soften before you finish coating them with chocolate, return the tray to the freezer to chill as needed. Once finished and all of the patties are chocolate coated, pop the tray back in the freezer set for about 10 minutes until the chocolate is completely set. Store patties in an air-tight container at room temperature, in the fridge, or in the freezer, depending on how firm you like them. They should keep about a week at room temp, but much longer in the fridge or freezer. 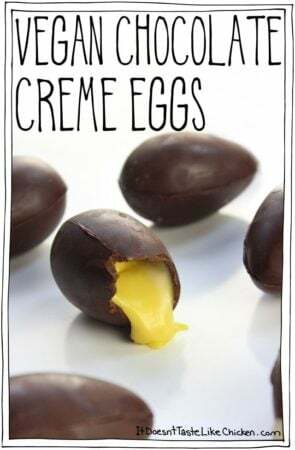 Absolutely outstanding~these are so easy to make and so delicious! Wouldn’t change anything~they’re awesome. These are just amazing!! I’ve made them twice in the past month. The first time was just as directed and it’s incredible how identical they are to peppermint patties! The second time I split the batch into thirds and did peppermint, orange, and artificial caramel flavouring (it’s vegan). Let me just say that these are all equally delicious and I highly encourage everyone to make these! Hi Sam! I have a recipe for chocolate peppermint patty cookies (from before I went vegan) where you wrap chocolate cookie dough around a a peppermint patty for a cookie with a yummy treat in the middle! Do you have a chocolate cookie recipe that you think would work for recreating this deliciousness? Ooooh that sounds amazing! I don’t have a chocolate cookie recipe yet, but I have added that to my idea list! I made these tonight, and they were so easy and so delicious! I will make them over and over! OMG! I just saw this and immediately made them as I had all the ingredients on hand. These are soooooo good! So good, that I just printed out a ton more of your recipes to try! Thanks so much for these, you rock!!! Can I freeze these so that I can make them ahead? Yes, they should freeze wonderfully. Enjoy! Suggestions for anything other than agave? I’d hate to have to buy a special ingredient just for one recipe. Made these for mom’s Easter Basket, in addition to your Vegan Mounds Bars (I added roasted Almonds to make them Almond Joys), and held a couple back for myself because York Peppermint Patties are one of the foods I adored before going vegan. I have to say these tasted almost exactly like I remember, only better. Thanks for the recipe! What are your thoughts on using coconut oil instead of vegan? I would think that the coconut would add a nice flavour but do you think you need to add salt to the recipe? Oops, that meant to say vegan margerine! I think it would work, but coconut oil tends to be meltier than vegan butter, so you may need a tad less and to keep them stored in the fridge. You can add a pinch of salt to taste if desired. Enjoy! 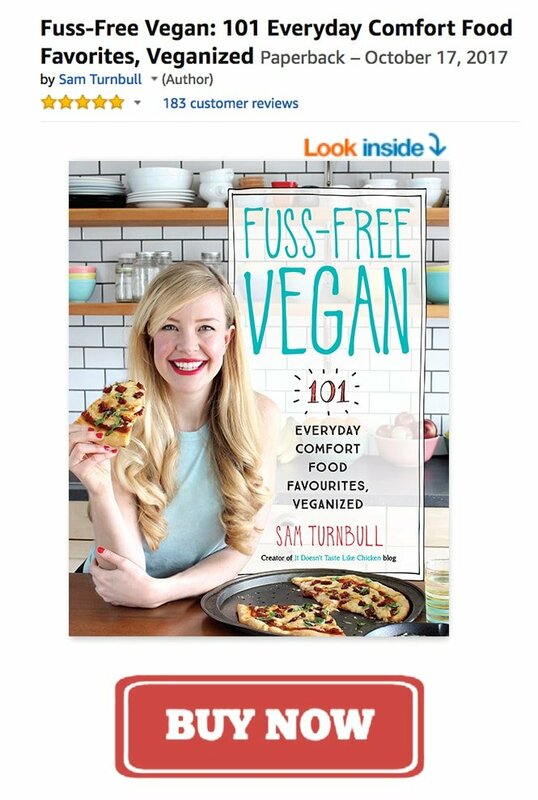 mmmm can’t wait to try another one of your amazing recipes! 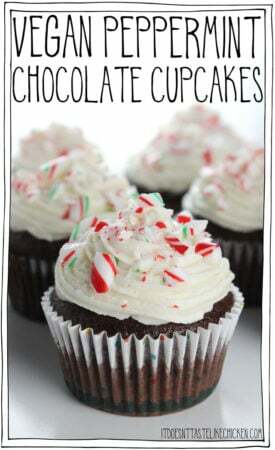 Do you know if one could use peppermint essential oil instead of peppermint extract in these delights? Yes absolutely! Peppermint oil is much stronger, so I would start with 1/4 teaspoon or less, and add more to taste if desired. Enjoy!